Replacement Bang & Olufsen Beocom 6000 2.4Ghz Cordless Phone battery pack. 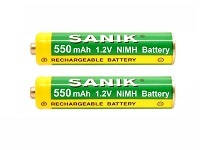 High Quality, high capacity, rechargeable battery with no memory effect being a NiMH battery. When installed into your phone, please follow charging instructions from you manual and reset the code in your set.